As in “Brave New World” by Aldous Huxley, where SOMA was the cure for day to day pressures, Hotel Vincci Soma is the perfect place to relax and forget about fatigue on both work trips and holidays. Now, KRION, the solid surface from PORCELANOSA Group, contributes to purifying the air of its rooms with K-LIFE. 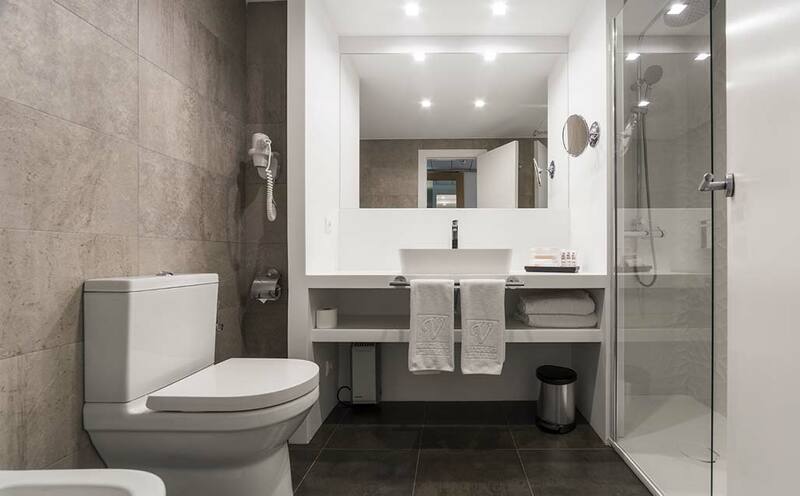 In the full renovation of Hotel Vincci Soma, different companies of the Group are present in the rooms and communal areas; but it is in the bathrooms where we can find K-LIFE as a covering and countertop, forming a giant “H”. In the bathrooms we find the MODUL ON TOP washbasin from KRION Bath, the LAND shower tray, NEO - YOVE shower screens and the SMART column from SYSTEMPOOL. Hotel Vincci Soma is located in Calle Goya 79, at the centre of Madrid in the Salamanca district. When staying there we can choose between double rooms, superior double rooms, junior suites, apartments, single rooms and XS rooms. Its 12 rooms for events are notable, which along with its library, gym, café-bar, own car park, and à la carte restaurant, makeVincci Somaone of the best choices for accommodation at the centre of Madrid. If you are thinking of staying at this hotel on a trip to Madrid, you should know that the bathrooms created with KRIONK-LIFE purify the air through PHOTOCATALYSIS; contact with either natural or artificial light activating the components found throughout the material, purifying the air breathed by 6 people in one year for every 1m2 of K-LIFE. KRION transformed by the company Encidecor.